As beautiful, charming, and hilarious as I am, when I travel, my gnome gets all the attention. When I pull him out to take pictures, he becomes part of the attraction, and other tourists follow suit. I’ve had him since 2012, when I saw two of my best friends get married in Seattle. 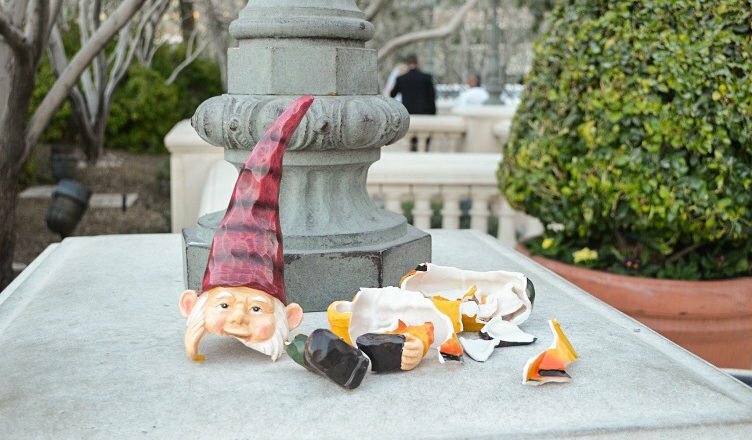 They hid about 7 or 8 gnomes (all unique) on the grounds of their wedding venue. Their intent was for people to travel far and wide with their gnomes and send pictures to the happy couple. As someone who travels obsessively, I had to have one. I didn’t find one, but thankfully toward the end of the night, the wedding planner pointed me in the direction of Honks (Honky for short). And we’ve been inseparable ever since. Like all good stories, it happened in Vegas. I was there with 7 other people. As you can imagine, partying was at the top of our to-do list. It’s Vegas; there’s only like 3 things to do there, and they all involve drinking. The weekend had already gotten off to a rowdy start. We had gotten wasted on the way over just to be able to tolerate our Spirit Airlines flight. By morning, some of us were already a little worse for the wear. But we powered through and went to brunch at the Bellagio, which is where God decreed gluttony would be a deadly a sin. For $31.99, you can eat all you want from their amazing and outrageously decadent buffet. For $43.98, you can also enjoy bottomless mimosas with your brunch. The last picture of Honky the gnome still intact. As you can imagine, everyone in our merry band of rabble-rousers opted for bottomless mimosas. We were there for what was probably close to 5 hours. Our server, who thankfully was really amused by us, kept ceremoniously popping bottles at our table until her manager told her to kindly ask us to leave. So we stumbled out of the Bellagio and went over to the fountain. I thought this would be a good time to take Honky out of my bag for a picture. Unfortunately for me and my gnome, my friend also thought this would be a good time to do a hand-stand. To do this day, I don’t know what compelled him to do that, other than 5 hours of bottomless mimosas. But he found himself halfway upside down with his legs swinging upward as I held my little gnome. His feet perfectly poised to kick him out of my hand. I helplessly watched my gnome fly into the air and then smash into dozens of pieces on the floor. I’m not a very materialistic person, but I had already decided that this gnome was going to travel everywhere with me. And now he was in pieces. I was shocked, devastated, and trying not to drunk cry about a lawn ornament. The alcohol really cushioned that blow. As did my friends who were on the floor laughing. So I joined in, because as they say, if you know you’ll be able to laugh about it one day, start today. So I picked up the pieces of my little friend and moved on. 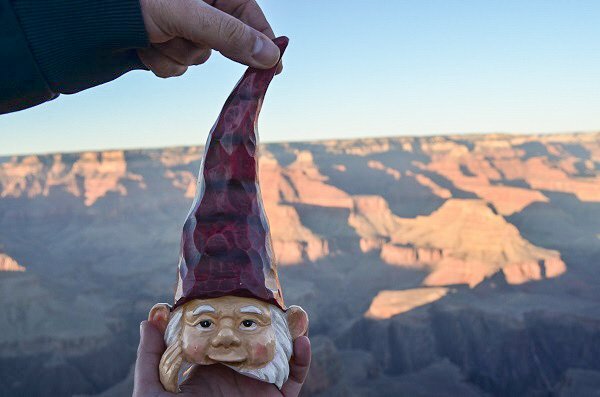 The next day, we went to the Grand Canyon, and I only had his head intact, which made for some really sad pictures. I’ve never posted this anywhere… you can see why. But luckily, my best friend – my sister, the only person I would ever get a matching tattoo with – is one of the craftiest people in this world. So when I got back home, she started performing surgery with Super Glue. There were some parts of him that I wasn’t able to recover, that may still be at the bottom of the Bellagio fountain. But she got him back in shape, even if he does have some tiny holes and is missing half his left foot. I slapped a Band Aid on his head, which I never ended up taking off. And to this day, he’s survived. Through glaciers and bumpy camel rides, from the beaches of Greece to the temples of Japan. The little guy is a trooper if there ever was one. And a gentle reminder that even if you’re a little broken, that should never stop you from living your life.